Yesterday, AT&T and HTC released an updated ROM for the Tilt2. Earlier this summer, a leaked version of this ROM surfaced over at XDA Developers. Asides from maybe a little fine tuning under the hood, the "official" version and the "leaked" versions are basically the same thing. 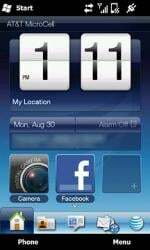 The update ROM is built on Windows Mobile 6.5 and Sense 2.5. This is probably the last hoorah for the Tilt2 and it would have been nice to see HTC and AT&T take the plunge and build this update on Windows Mobile 6.5.3. You do get a new radio version (4.49.25.95) which I have found to be a solid performer. Like the "leaked" version, the updated ROM has some zip to it. Sense tabs flow smoothly, apps load without delay, and the overall feel is improved. Also like the "leaked" version, AT&T choose not to include the most recent versions of essential software. The most notable outdated version is likely .NET Compact Framework. Sure, you could always install the current version but it's odd that AT&T would release a ROM with outdated software. Right? The "official" update also has the customary AT&T bloatware installed. 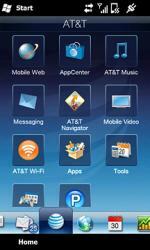 You have the AT&T Navigator, Media Mall, and an assortment of trial versions pre-installed. If you need to free up the space these app take up, you can always turn to third-party apps such as Crud Scraper to clean things up. In using the "official" update, it appears to be stable with no freezes, crashes or bugs experienced. Overall, as with the leaked ROM, I think the update is an improvement over the original. If you're running the original ROM, this update is worth considering. I don't think this ROM is strong enough to lure those running custom ROMs away from their chefs. But I have seen some really nice custom ROMs built off this update. For me, it's the little things that are missing that could have helped this be a better update. Little things such as a Task Manager icon on the menu bar or having "mark all as read" as an option on the email menu. You do have a Twitter tab but what about Footprints, Documents or Facebook tabs? It is nice to see AT&T give the Tilt2 one last update before it's likely to be replaced with an assortment of Windows Phone 7 devices, but I can't help but think they could have done more. You can download the official updated ROM for the Tilt2 over at HTC's support website.